Enjoy reading more testimonials from our Super Dooper Students. 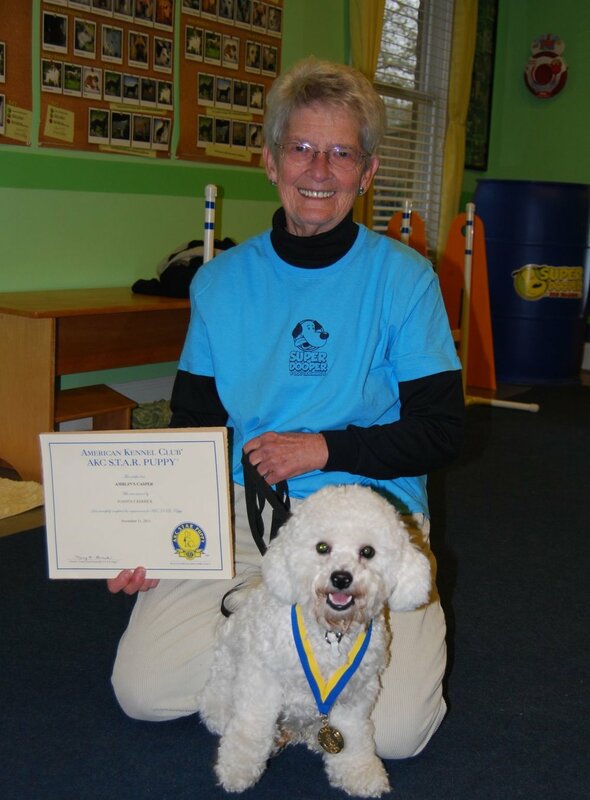 We love Super Dooper Dog Training and Pat Mitchell! Casper and Singer have each been through several classes from puppy, Canine Good Citizen, fun agility, good manners and therapy dog. Casper and Singer had so much fun learning in that environment and were happy when it was time to go to class. So glad to have been to Super Dooper where learning is fun for dogs and people! 7 years ago I needed help to bring my sweet, energetic 4 1/2 month old golden retriever to the high standards needed for TDI so she could work as a therapy dog. Pat Mitchell got us there in no time. When I decided to add another dog last October to our family, I couldn't wait to start classes again with Pat. Now our sweet, energetic golden doodle puppy is a student at Super Dooper Dog Training and doing great. Pat Mitchell and Patti Joiner work together to give our pups the best of the best. They deliver every time! They are definitely 10 stars in my book! Hi Pat... my daughters and I did puppy training with you several years ago…seven, to be exact, when we got our first puppy, named Rocky. Rocky is a Shih-tzu/Maltese mix and did great in your training class. We have just added to our family! We now have a new puppy, a Golden Doodle. His name is Moose. He is now 9 weeks old and will be ready for puppy classes soon. Rocky is still here and is adjusting to having a new baby brother who is almost bigger than him already. :-)... you have any classes scheduled to start soon for the puppy class. Also considering doing the Canine Good Citizen training with Rocky, just as a refresher for him. Best puppy training class ever! Pat and Patti are outstanding instructors! My puppy did not want to leave. Looking forward to next week! We loved our training at Super Dooper dog training with our puppy - great socialization in a small class atmosphere. Can't wait to take more training with Pat!